Back in October 2012 I created a word cloud out of my resume to visualize the essence of my professional skills and experiences. Now that it’s been almost 2 years since I did this, I thought it might be cool to create a new word cloud from an updated resume and see how they compare. Clearly a big part of my current professional role is still pretty much the same – exemplified by the word “research” as the most prevalent word in both groups. With the 2014 visualization, I can see that my role has expanded to include more “project management,” “consulting,” “business” and “strategy” than just flat out research. I still draw on the same fundamental epistemology in my work today as I did in 2012 (e.g., “qualitative” and “anthropology”), but it seems that my methodological toolkit has grown. 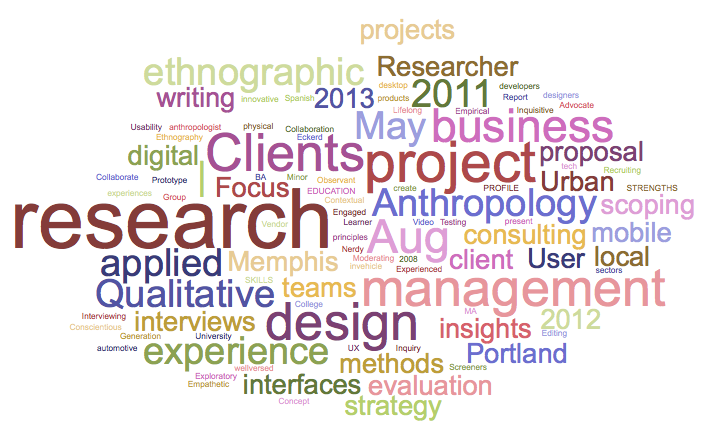 While the 2012 word cloud contains methods like “interviews” and “observation”, the 2014 word cloud features these plus the addition of “usability.” Finally, the word “clients” indicates that I have gained experience in agency-side work (versus my job as an internal researcher in 2012.) 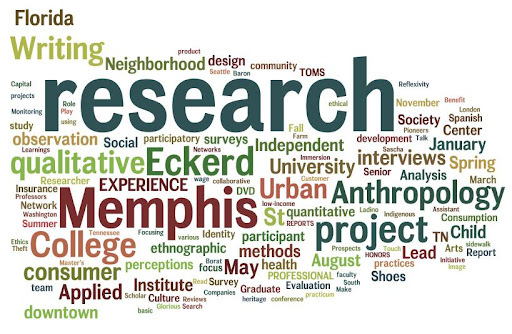 Overall, I didn’t have as much professional experience in 2012, so there were more words related to my schooling (e.g., “Memphis,” “Eckerd College,” and “writing”) than real-world work. I think it’s kind of nifty to easily see the nuts and bolts of my professional journey and to compare the visuals from year to year. Perhaps I will do this again after some more time has passed and see what further changes have taken place.